Should you lower your standards because your money well has gone completely low? Should you forsake quality knowing that the quantity of pennies in your pocket is close to nil? But when it comes to your kids, you tend to forget that your lifestyle has completely changed (read: that from a decent human being, you have been demoted to a a sewer rat's big toe's ingrown). Somehow, you cling to your ideal benchmark of parenting. And you do what you must to get back that tiny power so you can bring your kids to Cosmic Kidz instead of Kidz Republic. Did I lose you there? Allow me to explain. You see, I haven't brought my kids out in 2 months. The drill has always been school-home-school-home, and for weekends, a happy stare down with the TV and old pieces of homebased gadgets that don't need gas to run. It was ok at first. But eventually, my boys started to realize that they're being imprisoned. They never tell me straight. But there's always that, "Mimi, are we just staying home this weekend? ", and "It's really hot in this house.". Or the more painfully blatant, "I'm booooored to deeeeath...!!!" So this is me biting the bullet again with 2 playground choices for this weekend. On your left is Cosmic Kidz, a five-story building of interactive scientific fun. 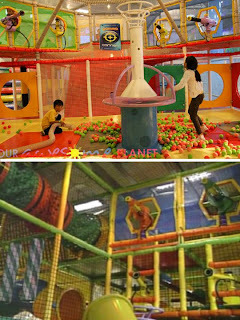 On your right is Kidz Republic, a three-story section filled with, uh, jungle adventure mixed with sports, and some non-conceptual shooting. Cosmic Kidz stays true to its play theme with a high-tech entrance manned by robot guards. Kidz Republic has the kiddie party thing going with adorable animal mascots in costume mounted on the walls. 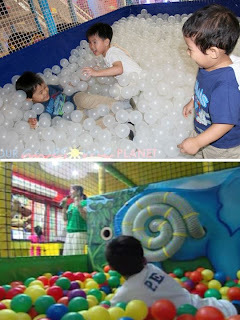 Cosmic Kidz has a soft orb pool as opposed to Kidz Republic's regular plastic ball pool. Cosmic Kidz' battle arena has a centerpiece alien formation target so the kids have shooting focus. 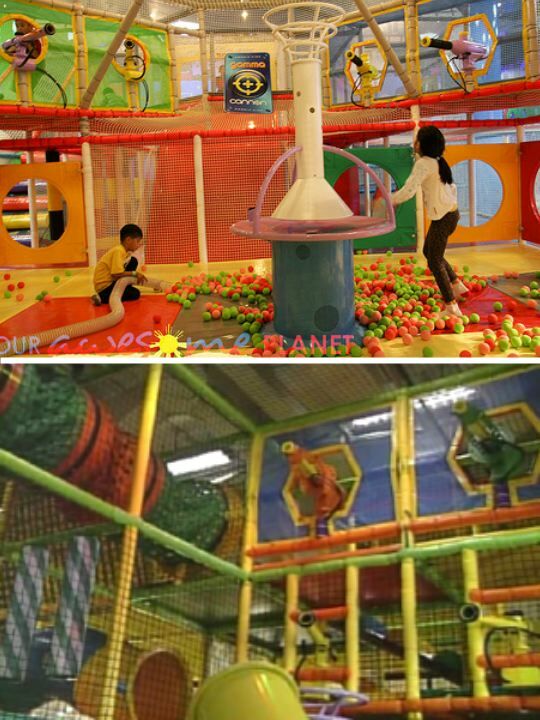 Kidz Republic's shooting range can be likened to a psycho attack --Shoot anywhere! Take your anger out on the world!!! It's not a fair review, I know, since I haven't been to either. But my advertising training passionately tells me that you can only pull out a good idea into its different parts thematically, seamlessly. And Cosmic Kidz is ferociously tight on keeping with its theme. In fact it spends big on quality play things just to carry on their science edutainment theme. Kidz Republic, I'm sad to say, lacks that crucial thinking. What it has is the 'Grab every cheap play thing in sight until we fill up this playground!' kind of thinking. The only interesting thing about it so far is that the playground employees are called Republicans --I kid you not. 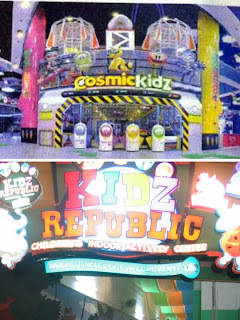 Cosmic Kidz is double the price of Kidz Republic. So logically, Kidz Republic is more appropriate for my kind of sewer rat's big toe's ingrown's budget. But you know what --screw logic.